In the spring and summer of 2007, off the coast of Valencia, the 32nd challenge for the America’s Cup was last held; possibly yachting’s oldest continuously contested trophy, and often referred to in the purple press as 'Yachting’s Holy Grail'. It attracted yachts from all over the world with the 12 syndicates involved spending millions of dollars on their boats in an attempt to win the coveted cup. In this challenge there was no British yacht taking part. Yet the right to challenge was once regarded as the sole prerogative of sailors from these islands. The English and the Irish competed over the years but in 1887 there was a uniquely Scottish attempt to win the cup. Appropriately, the challenging yacht bore the name Thistle. This is the story of how Scotland became involved in the challenge before the turn of the 19th century when not only Thistle but also Sir Tommy Lipton's yachts, all named Shamrock, vied for the prize. It also reveals the little known story of the Barr brothers from Gourock, John and Charlie. John was helmsman of Thistle as a challenger in 1897 and Charlie won the Cup in 1899 for America and successfully defended it on behalf of the New York Yacht Club in 1901 and 1903, becoming the first helmsman to win the Cup three times. 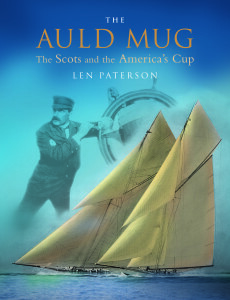 The first published insight into Scotland's contribution to the history and development of the America's Cup. "This is a well researched historical account and a great human story ... an ideal Christmas present for any Scottish sailor with an interest in our yachting heritage." Paul Jeffes, Yachting Life, December 2007. Len Paterson was the author of several books on shipping themes, most notably the Scottish puffer (Light in the Glens). He worked for over 20 years in shipping and was considered one of Scotland's leading authorities on nautical and canal transport. He was a founding trustee of the Scottish Maritime Museum.